A few questions on the various Greyhwak and Oerth related groups on Facebook have prompted me to think a little more about Dragonborn and their place on Oerth. This is something I began thinking about during the end run of my 3.x campaign, The DragonSlayers. The be reveal was going to happen when I ran the old BECMI adventure M3 Twilight Calling. Here the Carnifex were roughly analogous to orcs and to the Dragonborn's elves. I am also going to use the Tom Moldvay article on the Seven Planets from The Dragon #38. Which also includes Len Lakofka's updated AD&D 1st Ed stats for Tiamat and maybe the first Yellow Dragon. But I still need to run that. I did all the background work for that adventure and came up with some ideas of where to place the Red Mesa, which is a feature of the Dragonborn's homeland. In Krynn it is pretty easy. Dragonborn are either replaced by or used instead of Draconians. Though there are still many differences between the two races. In the Forgotten Realms Dragonborn are godless warriors that have been enslaved by the Dragon Tyrants of Abeir, the lost "twin" world of Toril. During the Spellplauge (cough*4thedition*cough) bit of Abeir and Toril combined and then split again during the Sundering (clearsthroat*5thedition) leaving some behind. Other worlds do other things. 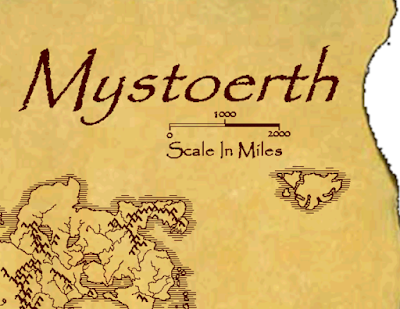 Mystara/the Known Wolrd has a thousand places for Dragonborn and any can work into the history. But Oerth is different. Let's check out some potential sites. Again this falls into another debate...what is and what isn't a canon map of Oerth. I am going to stick with the more recent one since it serves my purposes best. I am going to focus on the mostly undefined West since there a lot of good places to place the Dragonborn Empire (yes I am calling it an Empire, more on that in a bit). Like many lands on this side of the world, there is very, very little known and even less that have been published. Fireland, by its name, seems to be an area of volcanic activity or at least much hotter than expected. Also given its name and its location I am also inclined to draw parallels to Iceland. I like the idea of an island because it keeps the dragonborn remote and isolated. They could have been there for thousands of years and no one would have known. Besides, who else would live on a volcanic island? Ok, lots of people do. Another island and this time that really has a good "name claim". Draconis Island is smaller and less remote but still has a good claim. It is just about smack in the middle of the Celestial Sea, so maybe this is the home to dragons and/or dragonborn. It is also closer to the Eastern and more well-known areas of Oerth, so having dragonborn suddenly show up can be readily explained. Like Fireland there is a lot of appeal to me because it is an island. 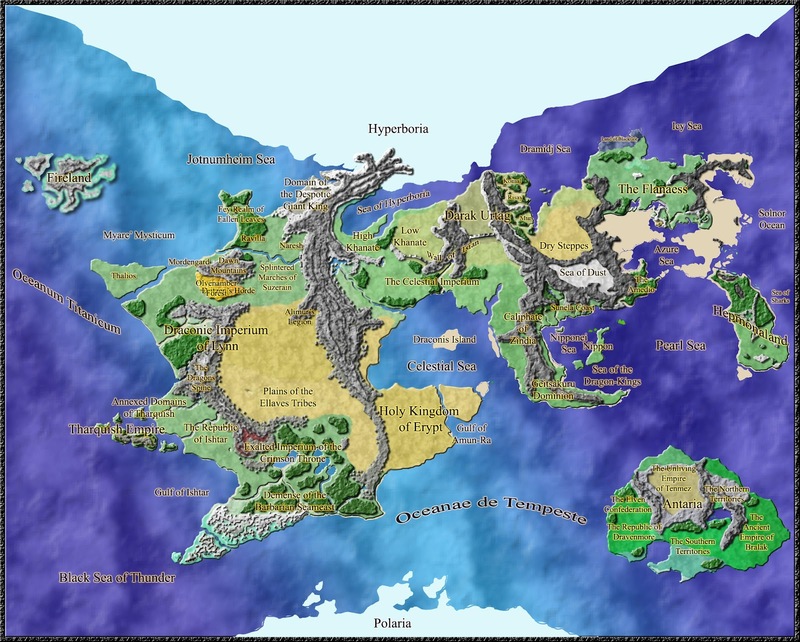 I am planning on molding MY Dragonborn Empire on the Dragon Empire of Melniboné of the Elric Saga. Instead of humans it will dragonborn and maybe not a cruel or decadent. This is a big one. Not just in size (it is the largest of the three) but also the name. 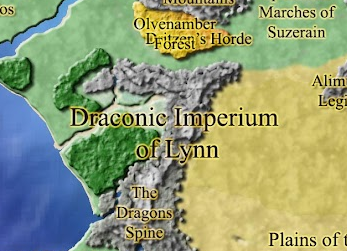 The Draconic Imperium implies a Dragon Empire. Whether ruled by dragons or dragonborn or humans that worship dragons, well it's hard to say. The only thing we know for sure about this area is there is a great city of Lynn and it is full of sea-farers and merchants. This also seems to be a favorite of some places online as well. For me though I am going with my Candidate #1, Fireland. It seems like a better fit for what I want with Dragonborn and still have them in my world. Speaking of which. "My world" isn't even Oerth. 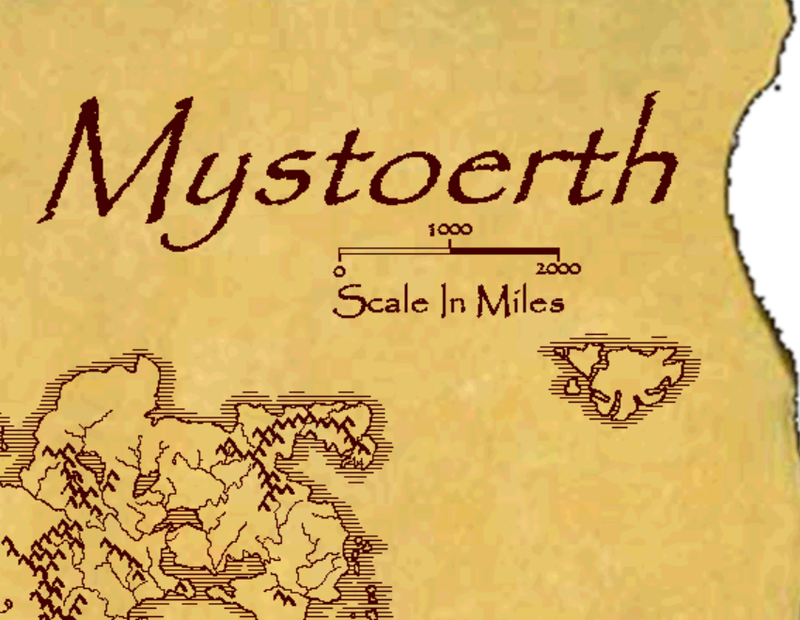 I am still happily using the merged Mystara/Oerth world of Mystoerth. In my world, Fireland is very, very far west. So far in fact it wraps back around to the East. I get a good sized island that is far enough away to be rumor and close enough that people have heard the rumors and believed them to be true. By human reckoning, there were no powerful civilizations more than 6000 years ago. This is human arrogance. When humans were still living hand to mouth as hunter-gather tribes and elves leaving their crystal cities of azure in the Feywild for the forests and wild places of the world the Dragonborn reigned supreme and unconquered. In their history when the gods and primordials fought in the Dawn War; Tiamat and Bahamut fought their titanic battle in the skies. As their blood fell to the ground the Dragonborn sprang into life. Since none knew whose blood they came from they honored both gods as their own. It is said that Tiamat fell from the skies and crashed into the Oceans. 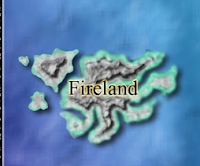 Her blood and fire and body rose up to become the volcanic island known to humans as "Fireland"; though in the Draconic language it is known as Arkhosia or "Cradle". Scholars are quick to point out the exact same word in old draconic means "Tomb". It was here that they built their empire. The great city of Aurix'ir (the "Golden City") was built. It featured the grand palace of the Emperor whose unbroken line can still be seen today and the even grander twin temples honoring Bahamut and Tiamat. Priest of both sects interacted here and were under strict oaths never to harm the other while in Aurix'ir. Within the center of the island, surrounded by icy peaks and volcanos lay the legendary Red Mesa and within the Red Mesa was the even more legendary Dragons' Graveyard. For the next 6000 years, the Dragonborn expanded their empire. Both Tiamat and Bahamut decreed that the riches in the Dragons' Graveyard would belong to the Draconic Empire and thus Emporer. The wars of the Dragonborn were in the prehistory of Humankind, but would have been glorious for a human historian. The First Great War was against the evil Carnifex. These lizard-men were the progenitors of Lizardfolk and Trogldytes and maybe scores others creatures. They were old, even predating the Dragonborn, and they had a prior claim to the Dragonborn Island (though it did not exist till the dragonborn did). The enemity between the two races was great; much like that between the elves and the orcs. Indeed the similarity does not end there. The Carnifex were the offspring of the great lizards known as dinosaurs and they represented a much different Oerth than what it was now. A hotter place, filled with life from beyond the stars or from deep time. The Second Great War, sadly was inventible as it was regretable. The Dragonborn came up against the expanding elves time and time again. Elves, with their ability to adapt nearly perfectly to their environment, were grabbing lands faster than the dragonborn could get their own people out into these new realms. The conflict was brief, but global. While both sides still hold long cultural memories of this war they have decided to work more towards peace, if not just a break from the hostilities. The Third Great War was between the Dragonborn and the formerly human, now tiefling Empire of Bael Turath. This was the war that would last 5 generations and destroy both empires. In the case of Bael Turath it would wipe them from the face of the world and the dragonborn would return to their island and never interact with the outside world again until recently. Some say the war began with a distarous first meeting between the two races, others say that war was always going to happen. In truth the war began in the Nine Hells when Asmodeus, always vying for more power, created the tieflings and cast Tiamat from Hell into the Abyss. Offended beyond measure Tiamats clerics screamed for blood and in a rare case of ancestry overriding other concerns even the clerics of Bahamut, who still consider Tiamat their "grand mother", joined them in their cries for vengence. Soon the lands, skies and seas were filled with battle. Dragonborn sorcerers battled tiefling warlocks. Paladins of Bahamut and Tiamat traded blows with hellknights of tieflings. Dragons attacked with mighty breath weapons while Olitiau, monstrous war-bats returned attacks with hypersonic shrieks. When the world could not contain their battles they spread to other realms and planes. They spilled each other's blood in the sands of Athas. They fought in airships over Khorvaire. On Krynn both sides were so bloody that all traces of both races were gone by the time of the Lance. Emperors on both sides had been assassinated and capitals had fallen. The war finally ended when the dragonborn finally broke the tiefling hold on Arkhosia and sent the tieflings fleeing. It is said that remnants of this war still remain and great and terrible magics are to be had. It is rumored that a tiefling spellbook from Bael Turath ended up in the have a wizard in the then young Suel empire. It is believed that the spell that caused the Invoked Devastation that came upon the Baklunish was just a fragment of a spell found. It would also seem the Baklunish had their own source of Turathi spells with the rain of colorless fire. When the war ended no one was a live to have remembered it's beginning. The animosty between the races today is one more of lazy hate. They know each other's history but also the long history of what the recovery from that war entailed. Given the dragon's proclivity to amass things I would say that Fireland/Arkhosia has the world's largest library on magic. Spells of every description, level, and type.